Fox in a Glove is a new made to measure fashion brand, who also offer a ready to wear collection and a complimentary styling service. The designs are modern, individual and unusual and are fairly priced. All the clothes are ethically produced by teams of professional seamstresses/seams-men around Europe who ensure the customer achieves an absolute perfect fit. I really like the idea of this brand, I know so many women who are a different size top to bottom or who just find standard high street sizes hard to shop, so it's great to see someone taking this on especially at a more accessible level. 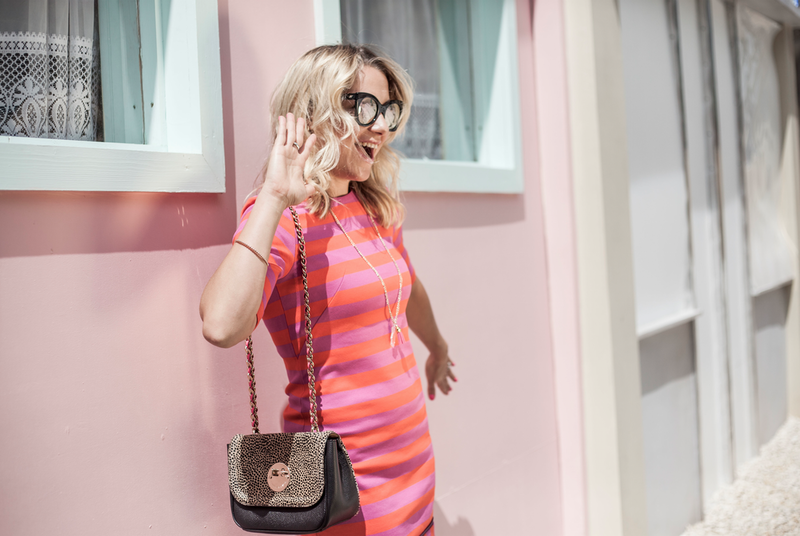 I'm wearing the Copenhagen dress in pink and orange - it is such great quality and so well made and unsurprisingly is the perfect fit! WHY WAS IT CREATED: To give buy, modern, 21st Century women the chance to experience made to measure clothes and get their perfect fit! We wanted to bring that retro-inspired experience of having your clothes personally tailored to fit you by a professional seamstress, but with the ease and speed of online shopping. We also offer ready to wear/standard sizes for a win/win shopping experience! WHAT WE NEED TO KNOW ABOUT YOUR BRAND: Fox in a Glove believes that women shouldn't have to conform to a size on a coat hanger - we think you are your perfect size and it's all about getting beautifully-crafted, perfectly fitting clothes to suit your style and make the most of your shape! We offer online made to measure clothes (and standard sizes too) and unlike bespoke and couture, which is usually associated with a pretty hefty price tag, we offer our clothes at high street price points. We choose all of our seamstresses personally - they work in progressive workspaces in Europe where they are paid fairly and enjoy what they do (so you can enjoy wearing your clothes too!). We offer high quality, trans-seasonal pieces with fine tailored details in a choice of cool, modern, unusual prints and fabrics which we personally source from around the world. Elegant, modern womenswear - and a complimentary styling service included. We love to hear from and keep in touch with our clients and we are happy to organise fun shopping gatherings at your home, work or for a weekend brunch where great women can gather to browse, bond and buy. WHAT WE SHOULD BUY FROM YOU: This season we think our go-anywhere-do-anything stripey Copenhagen dress, available in two colour ways, channels Scandi-girl cool and will take you from work to drinks to the dance floor :) Or you could match our gorgeous opaque black poncho Berlin top (ideal for breastfeeding as it fastens at the sides with poppers) with our zebra print a-line skirt for a great monochrome look.